Just what the range needed - a wholly versatile, mid-priced Pacifica with great style and tones to match. Great tones. Shrewd pickup choice. Excellent all-round performance. The 611 can achieve a wide range of tones. The Pacifica is Yamaha's most successful model. The '80s/'90s-style logo suits the modded ethos. A deep belly contour aids comfort. According to Yamaha, total sales of the Pacifica are in excess of 1,000,000 since its launch in 1989, and it's arguably the only brand that can hold its own at the lower and mid reaches of the market against the massive names of Squier, Fender and Epiphone. This new model is the result of more than a year's worth of planning, refining and testing and is based on two Custom Shop prototypes. "Our example of the 611 is finished in a hue called 'root beer', a colour that's attractively subtle and shows off the body's maple veneer very nicely indeed." Driving the concept of revisiting the range of mid- priced Pacificas were Yamaha's Mark Kirkland and Julian Ward, and the latter takes up the story. "We decided to base what was becoming the unofficial new Custom Shop Pacifica series on two models, ostensibly one each for the blues-rock player and the slightly heavier classic rock player. "The two models eventually became three, so we could offer a more affordable version of one of them, but the concept was based around the two guitars that would become the 510V and 611HFM. "The first thing we did was to spec some guitars that were very clearly targeted at specific players and that also filled a gap that we saw in the market," continues Ward. "We determined a target player's key style influences fairly easily - heavier blues-rock and crossing into some classic hard rock: Def Leppard, not Creed. It sounds like an obvious target of guitarist to go after, but there are surprisingly few choices if you're that guy and you don't want something 'standard'." The model has a solid alder body that's the same dimensions as the bread-and-butter Pacifica 112, and the general spec also includes Grover locking tuners and Graph Tech Black Tusq nuts. "We decided on a two-pickup design to suit bluesier players primarily, and we chose a P-90 for the neck position," confirms Ward. "An under-used pickup, in our minds at least, the P-90 seems to be the one everyone loves, but almost nobody has… especially on a non-Les Paul-style guitar." Our example of the 611 is finished in a hue called 'root beer', a colour that's attractively subtle and shows off the body's maple veneer very nicely indeed. The headstock is treated in the same manner and the vintage-tinted maple neck isn't too far away from that of a fatter '60s reissue Strat. The pickups are again Seymour Duncans: a Trembucker-spaced version of the full and powerful Custom V and the vintage-correct SP90-1 at the neck, selected by a three-way lever switch and augmented by a pull/push switch on the tone control to split the bridge humbucker. "We originally planned to use the Duncan SP90-3, but when I tried the first prototype at a gig, the mid-range just seemed too closed and hard," offers Ward. "There was too much gain, the high-end seemed a little harsh and it just didn't sound right." Plugging the guitar in, it's immediately apparent just how versatile the Pacifica design is. The 611 is full and articulate all-round, with the neck P-90 especially worthy of a mention. It's the perfect mix of vintage soupy low-end and modest treble cut, which is ideal at low gains for bluesy bends and smooth, almost jazzy chords. Splitting the humbucker and switching to the central position gives a lovely Strat-style, in-between flavour akin to a warmer version of Mark Knopfler's classic tone, and dropping the coil-split adds more depth and drive, which works well with full chords. The Custom 5 provides a full, yet sparkly rhythm tone with modest gain, and although it offers a certain level of vintage warmth, the more strident higher-end gives an increased modern feel. It plays very well indeed. Let's not pull punches. Fender and Gibson have the heritage in this market, but that doesn't mean there aren't plenty of us out there who fancy something that's different, cool and great value for money. 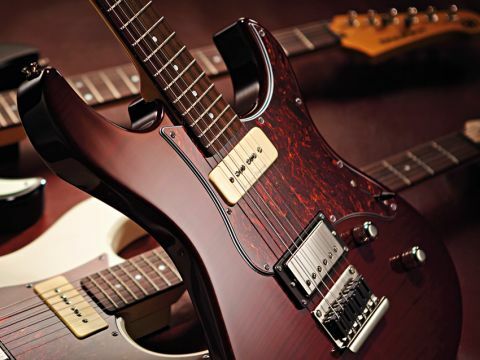 Yamaha's Pacificas have always ticked the value box, but this guitar adds an air of something more unique and desirable in the classic rock and blues cool of the 611: a good idea, well executed. We love the 611's depth of tone: give it a go and see if there's a budget boutique choice here for you.